Measured by overall association (A), between-state association (B), and within-state association (C). Centers for Disease Control and Prevention. Injury prevention & control: data & statistics (WISQARS). https://www.cdc.gov/injury/wisqars/. Accessed February 8, 2017. US Department of Health and Human Services. Health resources and services administration health workforce. https://datawarehouse.hrsa.gov/topics/ahrf.aspx. Accessed February 8, 2017. National Association of State Mental Health Program Directors Research Institute, Inc. Table 1: SMHA mental health actual dollar and per capita expenditures by state (FY2004-FY2013). http://www.nri-incdata.org/. Accessed May 15, 2015. Hedeker D, Gibbons RD. Longitudinal Data Analysis. Hoboken, NJ: Wiley; 2006. 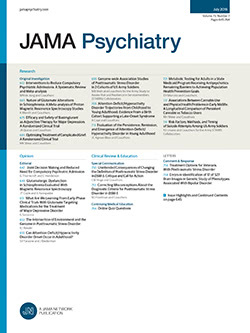 In the past 15 years, there has been a 22% increase in the national suicide rate in the United States,1 while the total number of psychiatric hospital beds in the United States decreased from 34 to 22 beds per 100 000 residents.2 Bastiampillai et al2 suggest that the availability of psychiatric hospital beds may be a risk factor in a complex network of suicide risk factors. We obtained state-level data from the Area Health Resource File on the number of psychiatric hospital beds (private and public short-term general hospitals), the number of substance abuse beds,3 suicide rates,1 and per capita mental health spending from 1999 to 2013.4 Between-state and within-state associations between psychiatric hospital beds, substance abuse hospital beds, mental health spending, and suicide rates were statistically estimated using a hybrid mixed-effects Poisson regression model (with annual state population size used as an offset).5 In the hybrid model, the between-state effect is estimated from the mean of the predictor over time and the within-state effect from the mean-deviation for each year. As confirmed with the University of Chicago institutional review board, the analysis of state-level aggregated US Centers of Disease Control and Prevention data is exempt from approval because all records are deidentified, and no informed consent is required. The simple inverse association is clearly apparent when considering the parallel time series only (Figure, A). However, the overall association is produced by between-state differences in the availability of psychiatric hospital beds (risk ratio, 0.987; 95% CI, 0.981-0.993; P < .001), accounting for a 1.32% increase in the annual suicide rate per 1 fewer psychiatric hospital bed per 100 000 residents (Figure, B). However, there is no within-state association between changes in the number of psychiatric beds and changes in suicide rates (risk ratio, 1.00; 95% CI, 0.998-1.004; P = .50), despite considerable within-state variability in psychiatric hospital bed availability (Figure, C). In addition, there were no significant between- or within-state effects of the availability of substance abuse beds on suicide rates. Finally, we found a small but significant between-state inverse effect of mental health spending on suicide rates (risk ratio, 0.999; 95% CI, 0.998-.999; P = .04), indicating a 0.01% decrease in the suicide rate for every dollar spent on mental health spending. However, there was no significant within-state association. The availability of psychiatric hospital beds and substance abuse beds in short-term general hospitals was not causally related to suicide rates. Some between-state associations were found; however, they were confounded with other state-level differences. Yoon and Bruckner6 found an overall inverse association between the state-level availability of public psychiatric hospital beds and suicide rates; however, our analysis suggests that this was a between-state association, and that changing the availability of psychiatric hospital beds within a given state will not reduce suicide rates. Changes in the number of substance abuse beds and amount of mental health expenditures were similarly unrelated to within-state changes in suicide rates. Our study is limited by the lack of available data on long-term psychiatric hospitals and stratification by public and private hospitals. Our findings indicate that attention should focus on determining how existing psychiatric beds are used rather than their absolute number. What are the proportions of high-risk patients being treated as outpatients vs inpatients, and how do their suicide rates compare after adjusting for risk profiles? Suicide risk is linked to rates of the diagnosis of major depression and how effectively it is treated at the outpatient level. Given that the US Centers for Disease Control and Prevention data on suicidal behavior, psychiatric diagnoses, and treatment in 18 states indicate that from 2005 to 2010, the rate of people receiving psychiatric treatment before dying of suicide was only 28.5%, there is considerable room for improvement. By focusing on hospital bed capacity, we may miss more fundamental deficits in detecting and treating patients at risk for suicide. Corresponding Author: Robert D. Gibbons, PhD, University of Chicago, 5841 S Maryland Ave, Room W260, MC2000, Chicago, IL 60637 (rdg@uchicago.edu). Author Contributions: Dr Gibbons had full access to all of the data in the study and takes responsibility for the integrity of the data and the accuracy of the data analysis. Drafting of the manuscript: Gibbons. Administrative, technical, or material support: Gibbons. Conflict of Interest Disclosures: Dr Gibbons has been an expert witness on statistical issues related to suicide for Pfizer, GSK, and Wyeth and is a founder of Adaptive Testing Technologies, which distributes computerized adaptive tests for mental health measurement. The terms of Dr Gibbons’ consulting arrangements have been reviewed and approved by the University of Chicago in accordance with its conflict of interest policies. Dr Mann receives royalties for the commercial use of the Columbia-Suicide Severity Rating Scale from the Research Foundation for Mental Hygiene. No other disclosures are reported.